Place the brown sugar, light corn syrup, salt, and butter in a microwave safe bowl. Microwave for about 1 minute, just until the butter is melted, then stir together until well mixed. Return to the microwave and cook for 2 minutes, stir, then cook for an additional 2 minutes. Add the baking soda and vanilla to the caramel. Stir until well mixed. Place your popped popcorn in a large bowl and drizzle the caramel over the popcorn. 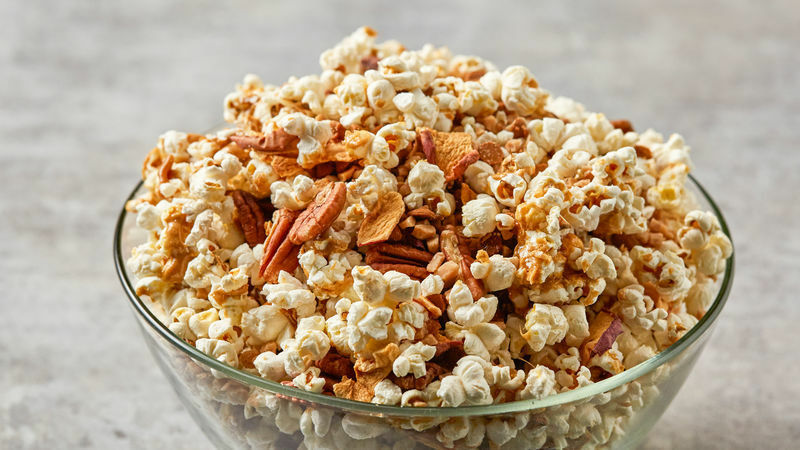 Sprinkle the cinnamon chips, toffee bits, pecans, and dried apple chips over the popcorn. Toss lightly. Allow to cool before serving. School's officially started and summer's officially over, which means all of the flavors of fall are officially open for indulging! We couldn't think of a better way to serve up a school-themed snack than to take all of the goodness of autumn apples and add them to a delectable Caramel Apple-Popcorn Snack Mix recipe. If you've ever enjoyed a hearty handful of caramel popcorn, you're going to adore this amped-up recipe. 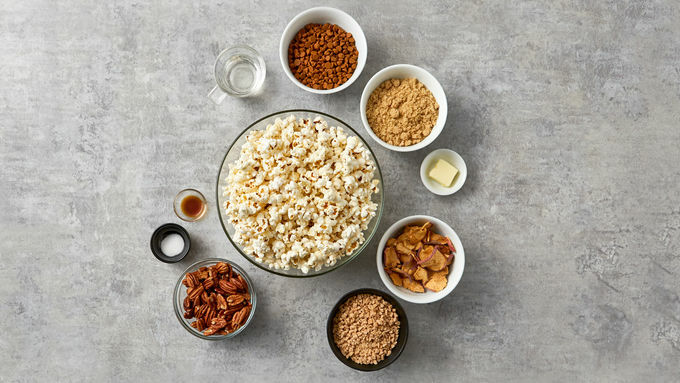 Not only is a pot of fresh-popped popcorn covered in caramel, it's also spotted with cinnamon chips, pecans, and teensy bits of toffee. Drooling yet? Toss in a handful of dried apple chips and you've absolutely arrived! This recipe makes a perfect teacher gift, party snack, or afterschool treat. Of course, it works equally well as a midnight snack. And maybe even a breakfast if you're anything like me … incapable of denying the scrumptiousness that is this popcorn. Enjoy! More Snack Mix Recipes Don't let hunger slow you down. These delicious snack mixes will keep you fueled and ready to go.